(April 14, 2006) At its meeting on April 11, the Charlotte-Mecklenburg School Board adopted "Winget Park Elementary School" as the official name of the new school under construction on Winget Road. Winget Park - The school is adjacent to Winget Park, which would make it easy for people to locate it. Also, the Winget Family has been prominent in the Steele Creek community since the middle 1800's. River Gate - To longtime residents, Lake Wylie is the "River." Pleasant Hill - The name of an early school that served the community until the 1920's. Winget Park was their recommendation. They said Winget Park was the preference of 60% of the students who will attend it this fall. River Gate had 30% of the vote and Pleasant Hill had 10%. Six future students of the school attended the meeting and expressed their support for "Winget Park Elementary!" Winget Park Elementary School is scheduled to open this fall. 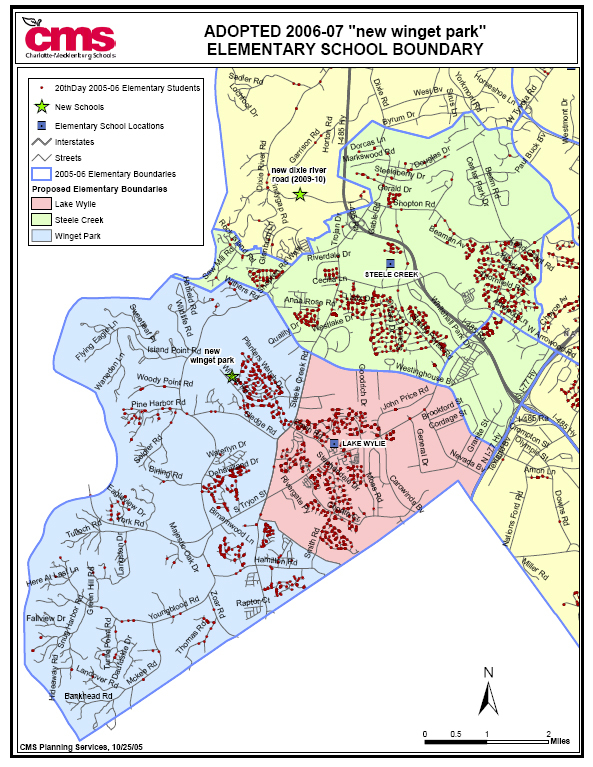 The attendance boundaries for Winget Park, Lake Wylie, and Steele Creek Elementary Schools are shown in the MAP below. The Winget Park attendance zone takes in the western part of the current Lake Wylie attendance zone. Winget Park will relieve the severe overcrowding that Lake Wylie has experienced over the last few years. The adjacent park was dedicated on October 15, 2000. It was named after Thomas McAllister Winget who died along with three other Olympic High School students in an automobile accident on May 17, 1969. School Board Chairman Coach Joe White said that this was one of the most emotional days of his life. He was the Olympic football coach at the time. "Mac" Winget was captain of the Olympic football team and president of the senior class. He lived across Winget Road from the park. The other students in the accident were Carolyn Watson, Mary Barden, and Mack Brown. This park is dedicated to the lives, leadership, and achievements of four young people who left us much too soon. Their lives exemplify that it is never too early to exhibit leadership and to establish trust with peers and adults. Often, as now, shortened lives extend their influence.